Google News will make it easier for news organizations to get its algorithms’ attention. A new “Standout” tag embedded into a story’s header can flag top or exclusive content on publisher’s sites. There’s also a peer-to-peer element, as the standout tag can also point towards competitors’ best stories. Google News now falls under the company’s Social Division, and it’s already beginning to show. These editors add a bit of code to the site or story’s header with a rel=”standout” relationship tag along with the standout story’s URL. “Google News may show the article with a ‘Featured’ label on the Google News homepage and News Search results,” attracting more eyeballs and (one hopes) giving more credit to the best journalism. But what’s to prevent web sites from marking every story they publish as “standout”? Google is limiting news organizations from tagging their own content more than seven times per week; blow past that speed limit and your tagged content will get throttled or ignored outright. What’s more curious is Google’s incentive (such as it is) for journalists to mark other organizations’ work as “standout.” There is no limit to the number of times you can link/tag another organization. It’s a solution that’s very Google, whose famous innovation in search was using links between sites as a way to measure their value. Google is simply expanding the ethos (and algorithmic power) of that link economy directly to news. Google News results drive a tremendous amount of traffic for news organizations, especially newspapers. At ONA, Google’s Rohe announced that between News and Search, Google sends one billion clicks every month to news publishers. In the past, though, Google’s traditional algorithm has benefitted big national outfits like The New York Times or Washington Post, whose pages draw a tremendous number of links, at the expense of smaller ones. There are many anecdotes of regional papers breaking news, only to watch Google drive traffic to the bigger fish who summarize and link to the smaller paper’s story. Since online news is usually the best or only way for these papers to get national reach, Google’s decreased ability to recognize their work is a real roadblock. At ONA, whose audience was filled with reportes and editors in the online wings of these news agencies, the announcement of the new Standout tag was greeted with applause. But there’s good reason to be skeptical. Every time Google tweaks its algorithm, clever SEO wizards find a way to hack and/or abuse it. What’s to stop websites from doing widespread standout-via-astroturfing, generating “independent” URLs that Google-Standout-bomb their own content? We should also never discount the antisocial tendencies of the journalism profession. Many news organizations have been reluctant to link out to other sites at all, let alone amplify those links with traffic-driving superlatives. Many of the bloggers I spoke with about Standout doubted that news organizations would tag any content but their own. Standout also worries CUNY Journalism professor and media critic Jeff Jarvis. “I think Google should make the standout tag transparent & give the audience tools to police its use,” he tweeted. Still, Google’s power means that the news organizations may have no real choice but to engage with and learn to love (or at least master) the new link economy. Google’s Head of News Products Richard Gingras also announced at ONA that Google News was now formally part of the company’s Social division. This means, among other things, increasing integration of Google News with Google+. 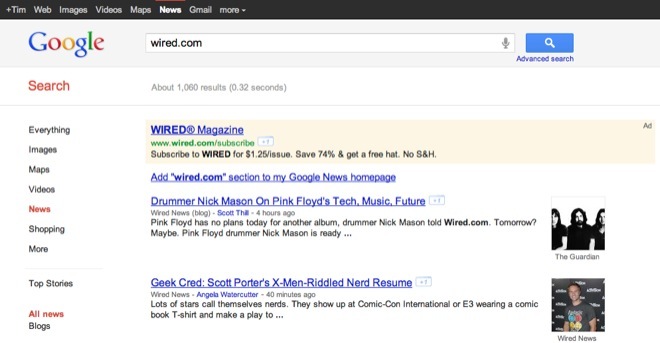 Currently, Google+ has “Sparks,” a lightweight Google News frontend powered by keyword searches. In the future, Sparks will probably not be so lightweight, its results (as in Google News) algorithmically screened/filtered/optimized (depending on your degree of optimism about the whole thing) by your social graph, subscriptions and what you’ve chosen to mark with a +1 in the past. Gingras also announced that official Brand Pages are “coming soon” to Google+. If you remember, Google warned brands off at the early launch, first gently, and then with a purge that left many companies and users unhappy and evolved into a broad “Nym Wars” attack on any and all names that didn’t look like individuals’ legal/wallet names. When they launch, Google+ brand pages will give news organizations another route both to their existing readers and Google+ users, as well as into the wider Google News traffic machine. This, in turn, will make Google+ more feature-competitive with Facebook, whose recent changes now offer media companies of all kinds a richer outpost for their content and engagement with Facebook’s gigantic user base. While growing, Google+ is still much, much smaller and engenders so much less engagement than Facebook. The major incentive to draw brands into Google+ is the hope of better placement throughout Google. This, in turn, will help drive growth in users and engagement in Google+. There are also widespread rumors of Google Propeller, a new Flipboard-like social news interface, which will doubtlessly leverage Google+, Google News and Google Reader. Propeller would also be competing with Facebook’s new Social Reader applications, with the Wall Street Journal, Washington Post and others increasing their efforts on that platform. Google’s cross-product synergy may not be music to the FTC’s antitrust-attuned ears, who are worried about Google’s use of its wider offerings to drive search results and vice versa. But for writers and editors who want and need to make themselves visible to all things Google, it’s a terrain they will have to learn to navigate. Both Facebook and Google are pushing towards personalized news. We’ve gone well past site-specific user profiles and simple cookies that track where you’ve been on the web. News in these environments now leverages your social graph — i.e., the existence and nature of relationships you have with persons and non-persons. Importantly, though, it also draws on a gigantic database of information and media, from photos to games to news stories, that are either stored within the application or shared with network partners. Furthermore, it blends the two, specifying your relationships with both people and media based by what you choose to share with whom. News organizations need Google and Facebook because they need readers, and need to meet readers where they are actually reading, not where they’d like to read. They need Google’s and Facebook’s data to retain those readers by offering them relevant information. Facebook and Google in turn need media partners to keep their users coming back and gather more data about them, which can in turn power further products. For all of Google’s products, the “standout” tag is really just a big fat +1 for self- and peer-promotion. News organizations that don’t use Standout may simply become left out. And how those organizations use Standout or any other “social news” element will soon affect what readers see, whether they’re aware of it or not. Thanks to National Journal’s David Beard who live-tweeted the Google session at ONA11.